There are certain things you should always be concerned about when it comes to the health of your mouth. If you have certain health conditions or are a smoker, there is even more reason to be cautious with something that appears unusual. In its early stages, cancer of the mouth may not cause any pain. Later, it can appear as flat patches or a canker sore-like ulcer that has a depression in the middle and looks white, yellow or grey with red edges. These patches can show up in any area of the mouth including the gums. Gum cancer can be confused with gum disease or gingivitis but some of the symptoms of gum cancer include, irregular growths or patches on the gums. These patches can be red and white (erythroleukoplakia), white (leukoplakia) or red (erythoplakia). Leukoplakia can be benign, but erythroleukoplakia and erythoplakia tend to be cancerous. The National Institute of Dental and Craniofacial Research recommends getting checked up if you notice any unusual growths that don't clear up on their own after two weeks. You will get a complete examination and a biopsy may be taken, if needed. Both gum cancer and gingivitis don't have any signs at the onset, but gingivitis should improve after a deep cleaning and with proper oral care at home. There is no reason to believe that gingivitis can cause gum cancer, but there is some connection between gum disease and lung, and pancreatic cancer, though the causes are not clear. 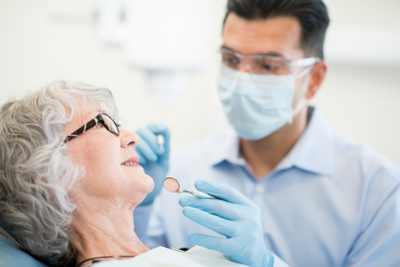 Keeping your regular checkups is the best way to prevent gum disease or gum cancer. Brushing twice daily and flossing is also recommended. Avoiding smoking and drinking alcohol in moderation can also reduce the risk of developing gum cancer and other oral diseases.